the entry requirements are like. some of the classics from yesterday going down the track. 2- Even though it may be hot....long pants, long sleeve shirt or jackets, must be worn. 3- No open toe shoes are allowed - tennis shoes are ok - but no sandals. 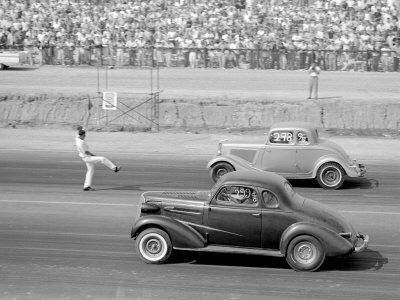 Cars faster than 14 seconds - you must abide by NHRA rules. If you even THINK your car will run under 14 seconds - bring a DOT approved helmet! place when leaving the starting line.